This is prototype has no date, but it is labeled revision 2.1 so it must fall between revision 2.0 (6-14-84) and revision 3 (7-3-84). Not much has changed in this revision, except for some color changes to the sky and ground and a few graphical tweaks to Anna lives remaining graphics. The title is yellow rather than green and is missing the TM. There is no collision detection, so you cannot die. Anna Lee has brown hair with yellow hair bands. The lives remaining graphics have been changed to reflect Anna's new look. The graphics are slightly different than the earlier 6-14-84 prototype (notice the longer hair). Anna's movement is very odd. She appears to sway back and forth. Anna jumps in upward in place rather than forward when the fire button is pushed. Anna jumps up and down much further towards the right edge of the screen when she reaches the end of the level. 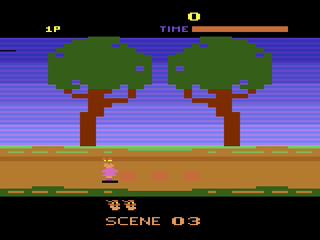 The graphics are different in some areas such as the fence by house on the starting screen. There is a nice sunset in the mountain background that was removed form the final version. There are no moving objects on the screens, only stationary platforms and water obstacles. Trampolines are not present yet. You don't die when the timer runs out. The music is slower and slightly different. The music stutters now and then. There are no sound effects. There is no victory music when you reach the end of a level. There are no bonus items in the trees. Scoring has not been implented yet. 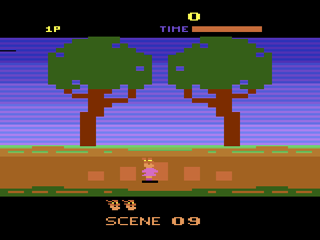 Three brown blocks (purple in later revisions) occasionally appear on some scenes. There is no collision detection with these blocks and they appear not to have been implemented yet. These were taken out of the final release. Why doesn't anyone want to play with me?